Bloomfield’s CEO power couple was featured in the winter edition of Clever Root magazine. The article was highlighting the brand as one of three organic cannabis names within the industry that were chosen to attend the Emerald Exchange this past fall. Discussed, are Sinclair’s southern roots and the hospitality that she cannot help but bring forth into the brand and industry. Bloomfield’s sleek and sophisticated shelf appeal stands out and is mentioned as “something that would appear in the accessories department of Bloomingdales.” The write-up also announces the company’s new pre-roll line that will be launching this spring and is expected to be just as visually captivating as the already existing products. 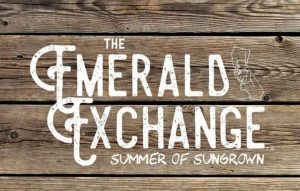 Events like the Emerald Exchange exemplify a true appreciation for small cannabis family farms. Each brand that has a representation is thoughtfully considered and chosen to be displayed at the event in Malibu. 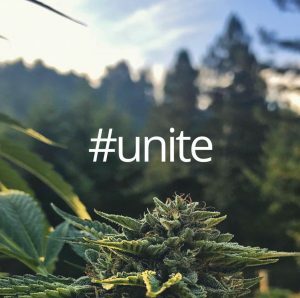 The event is in support of brands that have paved the way in the industry growing outstanding outdoor cannabis in Nothern California. The focus is to connect the Southern California market with the Northern California cultivators and bring these vastly separate and different worlds together. This creates a connection that allows for people to know their grower and appreciate the love and work that it takes to produce such a superior product. In these transitional times within the industry it is so important to take a stand for what we believe is right. To support those brands and farms that have stood in the trenches fighting and molding the industry into what it has become. Times like this bring about the reality of the industry and where we stand within it and show us who it is that stands with us. Bloomfield attended the Cannabis Women’s Empowerment Summit this year on January 13th and 14th. We were able to speak about the cannabis industry in more depth, regarding the intricacies of working in this emerging market as a women entrepreneurs. The 2-day summit addressed several topics; new regulations, trends, types of products in the market, dispensaries, distribution, marketing, social media, data collection, finance, marketing tools, and strategy for long-term success. We spent the day with great mentors, inspiring peers, networking, and left with a sense of empowerment, that energized and connected us into the next week. Now, more than ever, women are becoming the leaders in the cannabis industry, our focus on health and wellness to improve lives through plant medicine has only begun. A group from the summit also attending the Women’s March on Saturday, January 20th in Los Angelos, taking the women’s empowerment further. Inspiring women everywhere to follow their dreams and stand up for what they believe. Pictured is a shot of women seen at the march in LA. Bloomfield launched its Valentine’s Day collaboration bouquets on February 1st. We thought it would be a great way to promote not only some of our favorite brands but also provide a unique gift idea that is new and exciting. 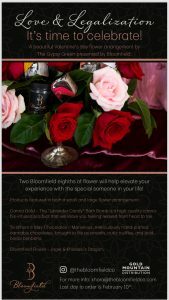 The bouquet comes complete with To Whom It May Chocolates, Canna Gold’s bath bombs, and of course two eighths of Bloomfield’s premium flower. Included are both an indica and sativa to get you through your entire Valentine’s Day experience. A great gift to provide an evening of relaxation and elevation with that special person in your life or even for a night to celebrate self-love.